This is a quilt I’ve been so excited to share. I made the quilt this past fall, but I can finally show it off. It’s called Square Knots. And the reason I can finally share, is that this quilt is in the Spring 2013 issue of Fons and Porter’s Easy Quilts magazine! This is my first quilt in a real magazine and it makes me a little giddy seeing it there. This issue has lots of great projects including beautiful quilts by Lee Heinrich of Freshly Pieced and Pat Sloan. This quilt was made using the Set Sail collection by Birch Fabrics with a blue Essex cotton/linen blend as the background. I love how the linen gives the quilt some texture and the color is perfect for setting off those nautical prints. The quilting was done by my friend, Monica Steelman. The finished quilt is 42″ x 54″. My favorite of the prints in Set Sail is the cheater squares print on the back. I’m also partial to the Sea Urchins. And right now, the whole Set Sail collection is on sale at Fabricworm. Looking at this makes me in the mood for summer. Kits for this quilt are available from Fabric Worm. 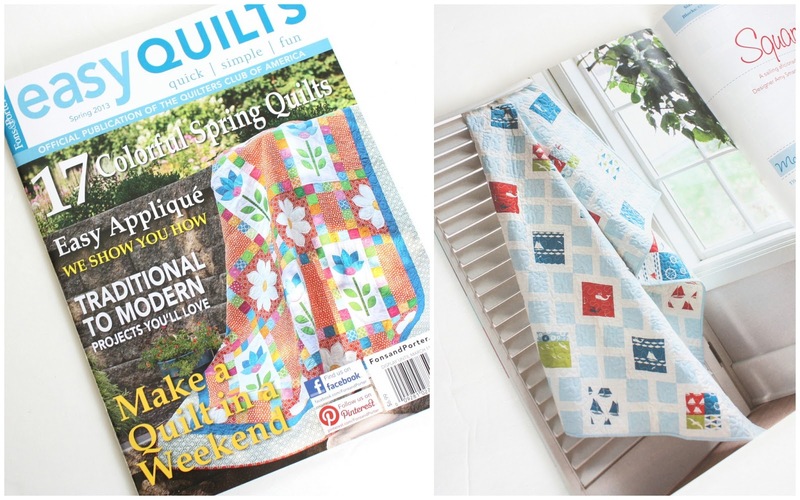 You can check out the other quilts in the Easy Quilts Spring 2013 issue here, or find in on your favorite local newsstand. O my gosh – this may be the cutest little boy blanket I&#39;ve ever seen!! Fantastic pattern and fabric choices! This quilt is fantastic! The colors, the prints, and the pattern especially! Lovely work. Love the quilt. The fabric is so much fun! Such a lovely spring quilt! Colors are very nice. Looks like a fun pattern to use too. CONGRATULATIONS&gt; How excited you must be.The back fabric is great. I will be picking up this Magazine as soon as it is in my local store. your quilt totally caught my eye when I bought the magazine last week! I love it. Congrats on the publication! I love the quilt it is so cute. Gorgeous! I&#39;m a cardmaker who follows a few quilting blogs (love the patterns) and for a second I thought this was a card, and by the time I thought – what a cool card – it looks like a quilt, the penny dropped and I figured it out! These are wonderful patterns and colours and I think you&#39;ve used them perfectly! Super cute! Love the fabric – makes me think of summer too. Congratulations! Congratulations, Amy!! With your beautiful work- I would think you&#39;d be in ALL the magazines ALL the time! Love your work!! Beautiful quilt- from the fabrics to the pattern- LOVE it!! absolutely darling pattern! love, love it! Congratulations Amy, it is a beautiful quilt. I had a little giggle whe. You said you wanted summer as it&#39;s summer here and it has caused all sorts of strife with fires. I&#39;m not sure if or how much Australian news is broadcast to you but it is a bad season for fires here. So as you wish for warmer weather, we pray for cooler – just to stop the fires. Perfect pattern, perfect fabric. Awesome quilt!! It&#39;s been said before aboce. But who can get enough of praise? CONGRATULATIONS. It&#39;s so exciting to be published for the first time, isn&#39;t it? Here&#39;s to a long list of such achievements. congrats! its lovely and makes me really want a boy for whom to sew! What a cute quilt! The fabric line works perfectly. I think I am going to have to track down that magazine. So happy for you Amy. Great quilt and I look forward to buying the magazine! Oh, I love it, Amy! Such a great pattern – I see one of these in my future!! I got this issue–just because your quilt was in it. SO cute! Congratulations! Your quilt is so darling. Love the fabric and design. They go perfectly together. Really sweet and congrats on the publication. Congratulations Amy — I Love it!!! I LOVE this fabric… cutest baby boy quilt ever! What a great pattern Amy! I absolutely love the fabric and the pattern shows it off perfectly. Congratulations on the feature! No one deserves it more. This such a cute quilt pattern! I love the contrast of the light solids and the bright prints. Congratulations on being published!!! Congratulations! It&#39;s such a lovely quilt, and I LOVE the fabric line! Congratulations! Great way to start off the new year. It&#39;s a lovely quilt. I&#39;m sure lots of successful projects and publications will follow. Congratulations, Amy! Sew happy for you! Just wanted to let you know that I made this quilt with different fabrics for my baby boy that&#39;s due next week. It was my first quilt and I LOVE it so much. Thank you for the inspiration and for all you do!! That is so great Tina! I&#39;m so glad you enjoyed making the quilt and that you are happy with the result. Good luck with your sweet new baby! I wonder how you manage to be so creative and efficient! I am new to quilting, and every time I search the web for ideas for beautiful and easy patterns, I always end up choosing yours! I am amazed it is the first time you got one published, but congratulations! Hopefully there will be many more. Thank You for sharing your ideas.